You may not be able to tell from this context-deprived picture, but Samsung's SP-H03 pico projector is small. Really small. Like, hockey puck small. And it puts 854x480 resolution and 1GB of internal memory in the palm of your hand. The SP-H03 weighs just half a pound, and brings grownup specs to the pico category. In addition to that WVGA resolution, it's got impressive 30 lumen brightness, microSD memory expansion up to 16GB, and an itty bitty 1W stereo for media presentations. It'll be available this month for $300, which sounds just reasonable enough that you should be able to get your company to spring for one for all those "important business presentations" you've got coming up. And if you end up using it more for putting home movies up on the garage door, well, who's gonna know? RIDGEFIELD PARK, N.J., June 9, 2010 – Samsung Electronics America Inc., a subsidiary of Samsung Electronics Corporation, today announced the SP-H03, a self-contained personal media device. The palm-sized pico projector features a bright, high resolution LED output and integrated multimedia player for the user on-the-go. The SP-H03's 1 GB of internal memory allows users to load content directly to the device with seamless, built-in multimedia playback without being tethered to a computer making it ideal for easily sharing images, videos, music, and documents on a variety on surfaces in business or personal settings. 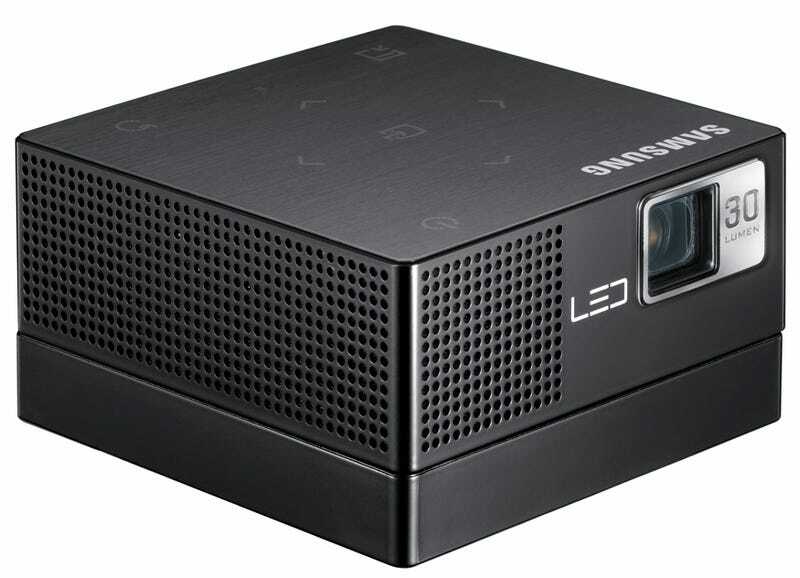 "With portable design, high quality projection, and built-in multimedia playback features, the SP-H03 is an expansion of Samsung's expertise in LED technology and mobile productivity," said Tom Grau, senior manager of projector marketing at Samsung Electronics Information Technology Division. "The H03's robust and intuitive features make it an easy, efficient and affordable choice for everyone from tech-savvy travelers to mobile presenters, professionals and educators." The new ultra-portable SP-H03 offers a small, well-balanced industrial design that weighs only 6 oz., allowing it to easily fit into a pocket, backpack, purse or briefcase. The solid-state LEDs and DLP® technology heighten performance with a picture output of up to 80 inches, ensuring everyone enjoys the show. The use of an energy-efficient LED light source also highlights Samsung's continued dedication to creating eco-sensitive products. Designed to last for the life of the product, solid-state LEDs maintain their brightness and eliminate traditional lamp replacement, contributing to a more-affordable total cost of ownership. Not only does the SP-H03 boast a computer-free experience, but it also allows users to project their content on-the-go via external memory or entertainment devices like USB storage devices, microSD memory cards or MP3 players. For added versatility, users can enjoy audio playback through the SP-H03's integrated 1W speaker or utilize the output connectors for personal headphones or external speakers. For business and education applications, Samsung's built-in Document & Media Viewers enable PC-free projection of Microsoft® Office Suite (PowerPoint, Excel, Word) documents, Adobe® PDF, movie, image, and audio files, in their native file formats. The SP-H03 will be available through Samsung authorized retailers, including Best Buy, beginning in June 2010 for $299.99 MSRP.